New Brunswick, N.J. – Marking a major milestone in what has become a fast-growing standard of care in prostate cancer surgery, the chief of urologic oncology at The Cancer Institute of New Jersey has completed his 1,000th robotic prostatectomy at Robert Wood Johnson University Hospital (RWJUH), the Flagship Hospital of The Cancer Institute of New Jersey, which is a Center of Excellence of the University of Medicine and Dentistry of New Jersey-Robert Wood Johnson Medical School (RWJMS). 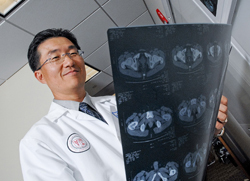 Isaac Kim, MD, PhD, associate professor of surgery at RWJMS, performed the operation recently on a Newark man diagnosed with high-risk localized prostate cancer. Robotic prostatectomy allows a surgeon to control a set of robotic arms that hold tiny surgical instruments used to remove the patient's cancer. Unlike the traditional open method of prostate surgery that results in a six-inch scar in the abdominal area, patients who undergo this minimally-invasive surgical technique are left with incisions smaller than a dime. In the U.S., robotic prostatectomy is being performed on 85 percent of men who have their prostate removed (Journal of Clinical Oncology - doi: 10.1200/JCO.2011.36.862). This compares to only 10 percent of men a decade ago after the procedure first received FDA approval and started to be widely used. Along with a minimally-invasive approach, the procedure allows for additional precision with a 3-D view of the tissue and delicate nerves that envelop the prostate. Reduced blood loss, shorter hospital stays and a faster time to achieve full continence are also hallmarks of the procedure. “During the seven year period during which I performed my 1,000 procedures, the blood transfusion rate was only 0.3 percent and the duration of the hospital stay was only one day in 95 percent of the patients. Simultaneously, rate of recovery of urinary continence and sexual function remain high,” noted Dr. Kim, who is also the executive director of the Dean and Betty Gallo Prostate Cancer Center at The Cancer Institute of New Jersey. Recent patient Sidney Travis had his cancer detected through a prostate exam during a regular check-up with his physician this past spring. He had just turned 50, and his girlfriend – a registered nurse – encouraged him to have it done. While the robotic technology allows a surgeon more advantages, Kim is quick to point out that it is having a surgeon who is well trained and experienced in the technology that helps account for positive outcomes. “Those in the field consider 250 procedures as a benchmark where one can start to achieve positive outcomes on a consistent basis. And we at The Cancer Institute of New Jersey and RWJUH are proud to be driving the next generation of innovative robotic surgical techniques, by offering specialized training to our surgeons,” he noted. RWJUH is one of the few hospitals in the state designated to teach other surgeons how to use the robotic system for the procedure. Kim’s achievement includes surgeries completed with the Athermal Intrafascial Robotic (AIR) technique, which he developed. In the AIR procedure, the nerve that controls a man’s ability to have an erection is better preserved by sparing over 90 percent of the tissue that surrounds the prostate as compared to 40 to 50 percent in the conventional open or robotic radical prostatectomy. Kim says that employing the AIR technique allows patients to regain sexual function and bladder control in a quicker fashion. Along with the 1,000 robotic prostatectomies, Kim has also performed approximately 100 robotic kidney procedures. The Cancer Institute of New Jersey (www.cinj.org) is the state’s first and only National Cancer Institute-designated Comprehensive Cancer Center dedicated to improving the detection, treatment and care of patients with cancer, and serving as an education resource for cancer prevention. Physician-scientists at The Cancer Institute of New Jersey engage in translational research, transforming their laboratory discoveries into clinical practice, quite literally bringing research to life. To make a tax-deductible gift to support The Cancer Institute of New Jersey, call 732-235-8614 or visit www.cinjfoundation.org. Follow us on Facebook at www.facebook.com/TheCINJ. Robert Wood Johnson University Hospital (RWJUH) is a 600-bed academic medical center and the principal hospital of UMDNJ-Robert Wood Johnson Medical School in New Brunswick, NJ. Robert Wood Johnson is an innovative leader in advancing state-of-the-art care. Its Centers of Excellence include cardiovascular care from minimally invasive heart surgery to transplantation, cancer care, and women’s and children’s care including The Bristol-Myers Squibb Children’s Hospital at Robert Wood Johnson University Hospital (www.bmsch.org). The hospital is also a Level 1 Trauma Center and serves as a national resource in its ground-breaking approaches to emergency preparedness. The hospital has earned significant national recognition for clinical quality and patient safety. RWJUH ranks among the best hospitals in America, according to U.S.News & World Report’s 2012 ranking of “America’s Best Hospitals.” It is the sixth consecutive year that RWJUH has achieved this prestigious ranking. The Bristol-Myers Squibb Children’s Hospital is also ranked among the nation’s Best Children’s Hospitals by U.S.News & World Report. The American College of Surgeons’ Commission on Cancer has rated RWJUH among the nation's best comprehensive cancer centers. The Leapfrog Group rated RWJUH as one of the 50 exceptional U.S. hospitals, as published in Consumers Digest magazine, and has given the hospital an “A” grade for safety and quality. Harvard University researchers, in a study commissioned by The Commonwealth Fund, identified RWJUH as one of the top 10 hospitals in the nation for clinical quality. RWJUH is also a four-time recipient of the prestigious Magnet Award for Nursing Excellence. Visit us online at www.rwjuh.edu.